The tragedy of September 11, 2001 shocked the whole world with its senseless brutality. These attacks resulted in the former U.S. President George W. Bush declaring war on international terrorism. Washington said that the enemy was “Al – Qaeda”, which found a safe haven in Afghanistan that was controlled by Taliban in the 1996 – 2001 period. A total of 70 countries supported the “Enduring Freedom” operation, 40 of them agreed to join the United States on their quest. Russia in its turn agreed with the temporary deployment of U.S. military bases in the strategically important for the national interests of the Central Asian region. Joint efforts removed from power and greatly weakened the Taliban movement. This created a good environment to limit their influence not only in Afghanistan but also in neighboring Pakistan, in the borderland areas where the Afghan militants found a refuge. It would seem that the war on terror is close to completion. But President Bush Jr. did not have the political wisdom. Rather than continue the fight in Afghanistan, he switched to so tempting Iraq, and incidentally decided to reform the whole Middle East. A chain of endless wars has started in which there were no winners. Worse, the “Al- Qaeda” so strengthened that began to control large areas of Iraq, Libya, Yemen and Syria. In fact, the Americans nurtured it themselves by extremely ill-conceived policy of intervention in the internal affairs of other states. And Pakistan is no exception here, that can serve a perfect example of the Western ways of fighting international terrorism. “Enduring Freedom”, held by the U.S. and its allies in Afghanistan, ousted both the leaders of the “Taliban” movement and “Al –Qaeda”, and a significant number of radicals in the Federally Administered Tribal Areas (FATA) of Pakistan. So, in the end of December 2001, about 500 militants of the movement “Al- Qaeda”, who fled from Afghanistan, were seen near the city of Peshawar. Thus Pakistan was drawn in the anti-terrorism campaign. Today the terrorism matters are of utmost importance for Pakistan, since the Afghan Taliban militants have relocated to the Federally Administered Tribal Areas of Pakistan. At this point the fight of Afghan Taliban was supported by Pakistani Pashtuns. The support movement started in the South Waziristan province but soon it spread all across FATA, when armed groups were assembled here and there in order to help the Pashtuns fighting NATO forces in the southern Afghan provinces. Washington demanded that Pakistani authorities should put an end to the new waves of militants coming across the Pakistani border. Islamabad decided to bring regular troops to FATA, which resulted in armed clashes. Perhaps it was then Islamabad committed a serious error when it signed a secret agreement with Washington that allowed U.S. Special Forces units to conduct search and prosecute representatives of the “Al- Qaeda” in Pakistan. The specified agreement provided for against the militants not only land-based activities, but also the use of aircrafts. The aircrafts in the form of shock unmanned aerial vehicles (drones) (UAVs) have created for the Pakistani authorities the greatest challenge in recent years. The reason for this was that the actions of U.S. drones were not accorded with Islamabad. At the same time, their strikes occasionally resulted in significant casualties among the local population. Thus, according to Western reports, only in the period from June 2004 to September 2012 in Pakistan as a result of the UAV attacks 3,325 people were killed, including 881 civilians, 176 children among them. Such activities had a negative impact on relations between the U.S. and Pakistan, even in the face of acute dependence of Islamabad on the U.S. The bilateral relations strongly deteriorated after November 25, 2011 when the U.S. helicopters killed border checkpoint of the Pakistani army “Volcano”, which led to the deaths of 15 and wounding of 24 (later it was 27 dead) soldiers. As a consequence of long ceased transit of U.S. supplies to the Allied Force in Afghanistan. On November 28 American airstrikes destroyed a check post near a border village of Salala, leaving 24 Pakistani soldiers killed and 14 more wounded. This attack provoked a wave of anti-American protests all across Pakistan. As a result Pakistani authorities decided to close all the routes that supplied the allied forces in Afghanistan. In December the Western media started to undermine the authority of Islamabad by trying to convince the people around the Globe that there’s a coup d’etat that should be taking place in Pakistan in the nearest future. In return Pakistan demanded to put an end to the usage of the U.S. drones in the Pakistani airspace. This demand was ignored by the U.S. since they believed (and continue to believe) that “drones are absolutely necessary for them to able to fight international terrorism”. In the winter of 2011-2012 there was a new strain of relations between Washington and Islamabad. Then, in the Pakistani province of Baluchistan there were performances by local residents with the requirement to give them independence. They were attended by a small number of people. However, in early February 2012 the Subcommittee on Oversight and Investigations of the Committee on Foreign Affairs of the House of Representatives of the U.S. Congress held hearings on the issue of Pakistani Baluchi, on 17 February, 2012 the U.S. Congress introduced a draft resolution calling for recognition of the rights of ethnic Baluchi in Pakistan for self-determination. In Islamabad, it was perceived as interference in internal affairs. As a result, the American ambassador was harshly protested. But mutual suspicion remained due to increasing rapprochement between Washington and New Delhi. In these circumstances, the West began to accuse Pakistan of a low level of cooperation on the Afghan problem and covert support of the movement “Taliban”. Thus, the main blame for the apparent failure in the fight against international terrorism has shifted to Islamabad. In September 2013, All Parties Conference was held in Islamabad at which all interested political parties discussed ways to achieve peace in the country. This conference was convened at the initiative of Prime Minister Nawaz Sharif to reach a consensus among all political leaders (stakeholders) on the issue of combating terrorism and enhancing security in Pakistan. The resolution was condemned in the West as one expected the newly elected Prime Minister Nawaz Sharif to continue the fight against terrorism only by force led by the U.S. and its allies. Instead, at the beginning of the resolution, it was noted that during the war against international terrorism thousands of soldiers and local residents were killed, and as a result of illegal drone attacks and air strikes of NATO member countries had caused significant damage to the objects of social and economic infrastructure Pakistan. The main objective of the conference was the comprehensive cessation of violence by terrorists and other radicals on the basis of a compromise acceptable to the parties. This is quite natural for a country whose internal situation is not sustainable. 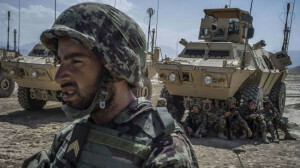 West was obliged to support this initiative of the Pakistani leadership, at least, to stabilize the situation in Afghanistan in the significant reduction of foreign military presence there. However, this did not happen. The article by Rob Crilly “Only in Pakistan Can the Taliban be Described as Stakeholders” published September 10, 2013 in the British newspaper “The Daily Telegraph” is Evidence of this. First, the very title of this article is surprising. Americans have been trying to negotiate with the so -called moderate wing of the “Taliban” movement in order to resolve the Afghan problem. And it does not raise any objections to the West. Why cannot Islamabad do that? Are the Pakistani Taliban are more radical than Afghan ones, which they cannot negotiate? Maybe the U.S. and its allies are not interested in a stable Pakistan, which will pursue an independent foreign policy? Apparently, the latter assumption is well founded. Second, the successful fight against terrorism and strengthening of internal security contribute to the development of the national economy and attract foreign investment. Third, any concrete actions against international terrorism require a high level of mutual trust. Its absence cannot be replaced by any modern means, especially by the action of shock systems on the territory of another state. Fourth, the author of the article did not take into account the fact that the vast majority of the ruling elite of Pakistan share the views of Prime Minister Nawaz Sharif on the problem and urge the government to start a dialogue with all stakeholders. Fifth, the problems of Pakistan should be decided only by the leadership of this country, which has the political will and determination in the fight against terror. The culmination of a short-sighted policy towards Pakistan was the fact that on November 1, 2013 as a result of U.S. drone air strikes in Pakistani North Waziristan bordering with Afghanistan, where the leader of the movement “Taliban Pakistan” Hakimullah Masud was killed. And it came a day after the statement of the Prime Minister of Pakistan Nawaz Sharif to start peace talks with the Taliban. It resulted in breakdown of negotiations on yet started peace dialogue. There is no doubt that the policy of leading Western states has a negative impact on the situation in Pakistan and neighboring Afghanistan.